IAU WGSPC finally, after 42 years, officially approved names for hitherto unnamed craters along the path of Lunokhod-1, the first extraterrestrial rover in History. Until now, IAU WGPSN only approved originally informal, astronaut-given landing site names of the American Apollo missions, and but rejected similar names from (automated) Soviet mission. This practice of IAU WGPSN was heavily criticized for decades (For example, here) but it was hoped that feature names of the Soviet “heritage sites” (see here) will be put to the official Gazetter. The main reason was that the coodinates of the landing site remained uncertain. The big wait got a new hope as LRO camera team discovered the rover in 2010 and its exact positions became known. At Lunokhod 1 site, IAU named previously unnamed small craters and updated the IAU rules according to which “First names are used for small craters of special interest.” (IAU WGPSN Gazetteer, 2012), referring to an 1976 decision when IAU approved some of the informal names on maps based on very high resolution Apollo imagery. First names are not very frequent on the Moon, but here is a random sampler of the craters named for first names: Ewen (approved in 1979), Monira, Soraya, Karima, and Fairouz (approved in 1976) or Isis and Osiris, who were born in 1976 as Egyptian goddess and god but who miraculously became common first names in 2010 — they may have become not politically correct in the lunar pantheon. It should be noted, that although there is no new category for Soviet landing site names, the “(Lunokhod-1 landing site feature)” tag appears next to the explanation of origin of each names near the Lunokhod-1 site. Now that it was done for Luna 17/Lunokhod1, we are ready for more. The LRO team identified the exact Luna 21/ Lunokhod 2 location in 2012. 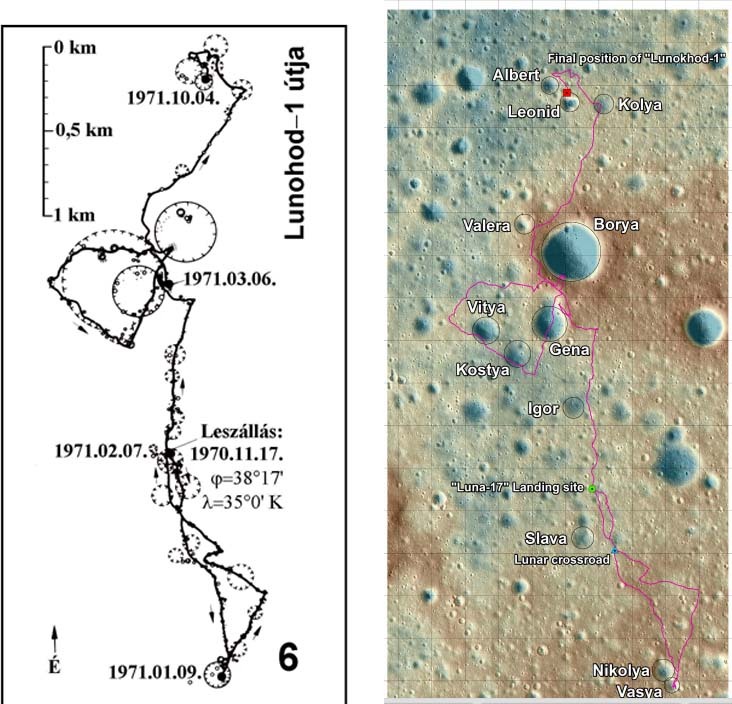 Whereas Lunokhod 1 landing site got no informally named features at the time of landing, the Lunokhod 2 landing site is full of interesting informal names, similar to what Apollo astronauts gave at their landing sites. Now we will see how IAU handles this and we’ll see if they want to make the same exception that they did with Apollo. 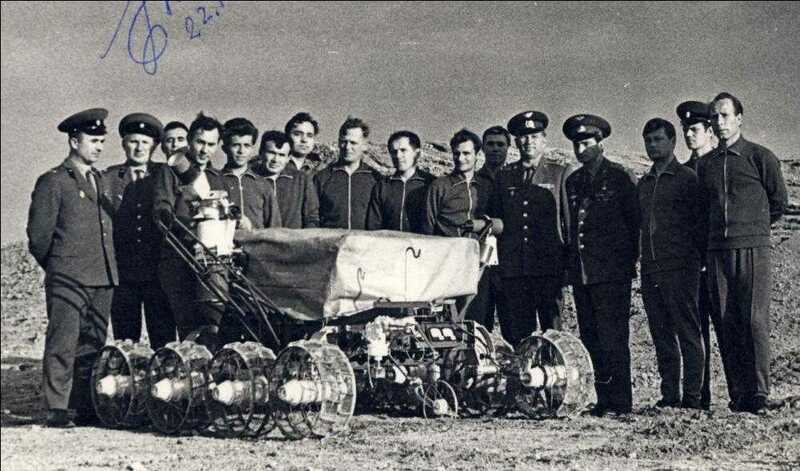 Just a few of them: On 19 March Lunokhod 2 was driven through a sallow trough Unnoticed Rille , also having a latinized form: Fossa Inconspicua which was apperentily so subdued that it was barely noticed (Lunokhod drove 16 km in one day). Other names used: Straight Rille = Fossa Recta Round Goulf (Circle Harbour) Bukhta Kruglaya Tangled Hills = Retzsnye Shallow Craters = Krater Pologij Far Cape = Mys Dal’nij Near Cape These names were the only informal names in soviet landing sites. (Source: Stooke, Philip: The International Atlas of Lunar Exploration. Cambridge University Press, 2007 p. 373). The importance of names can be illustrated in these traverse maps: it is difficult to speak about locations if there are no names assigned for features. 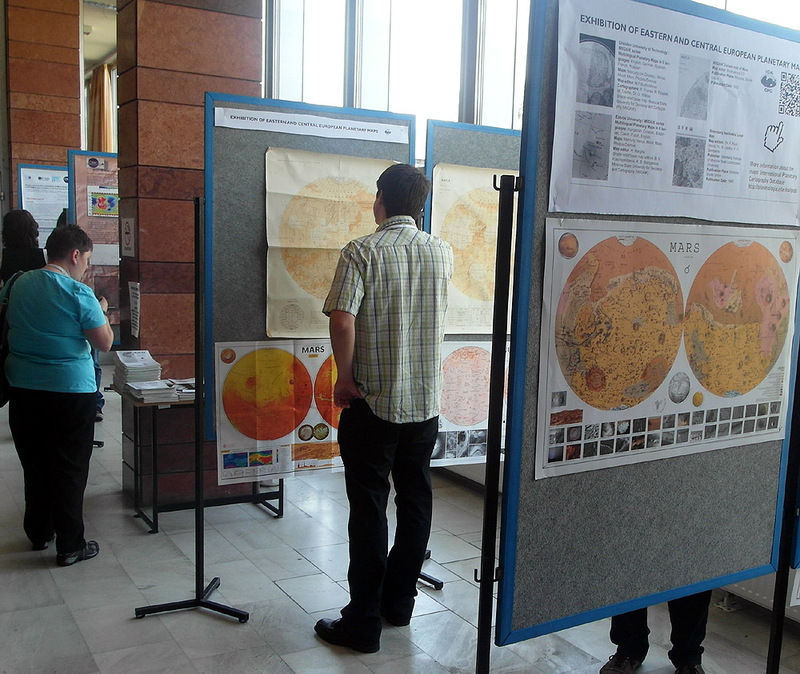 An exhibition of 19-21th century planetary maps made in Eastern and Central Europe is taking pace in Budapest, at the “Connecting Planetary Scientists in Europe (MPSE)” workshop on Mars at the Institute for Geological and Geochemical Research. Among the exhibited maps visitors can see Mars maps from 1880 to today, and various planetary maps made in Germany, the Soviet Union, Hungary, and Croatia. IAU WGPSN has decided to start a new naming system for asteroid Stein, violating previous unwritten concepts of the planetary nomenclature. They have named 23 craters after gemstones, in English. So far the planetary nomenclature seemed to be “international waters”, and used Latin as a neutral platform for naming features. Now this is officially over: although gemstone names have international roots and most of them do sound alike in most languages, names like “Diamond”, “Agate”, “Emerald”, “Garnet” are clearly discriminating all languages that use a different form. If IAU WGPSN would want to stick to their own traditions of internationalism, they should have tried to name these features in Latin (adamas, achates, smaragdus, granatus etc.) but they did not seem to care about it. Now explain planetary science students in non-English countries why a gemstone’s name should be written in English on an asteroid.